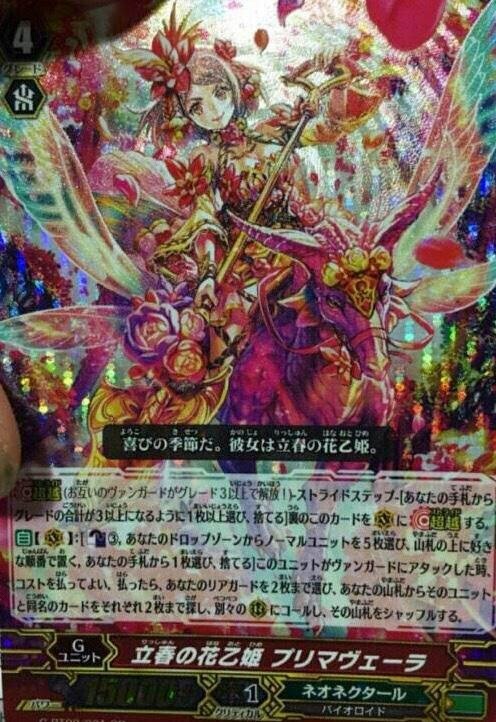 Over the previous weekend Primavera, the cover card for G-BT02: Soaring Ascent of Gale and Blossom, was leaked by first recipients of the new booster set. Near as can be discerned the Primavera leak originates from an early morning Twitter post and was popularized a minute later by tournament organizer Sukacat. The new face of Neo Nectar has now become Monday's Japanese card of the day. 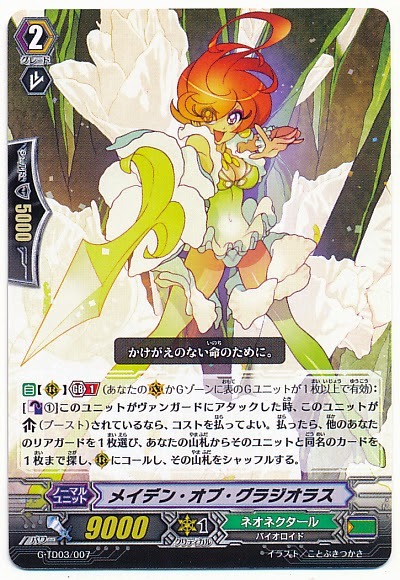 In contrast to persona generation units like Jingle Flower Dragon, Primavera is designed so that she can be use up to four times per game, but only as long as Neo Nectar cardfighters can effectively manage their counterblast. Her skill is not attached to persona or on-hit conditions, instead to a more traditional counterblast 3. Envisioned as a field restand, her skill selects two of her own rearguards when she attacks and calls out two copies of each card selected, forming two full rearguard lanes. 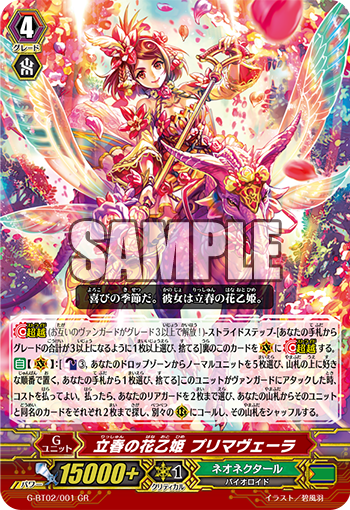 AUTO (Vanguard circle): [Counterblast 3, choose five normal units from your drop zone and put them on top of your deck in any order, choose a card from your hand and discard it] When this unit attacks a vanguard, you may pay the cost. If you do, choose two of your rearguards, and from your deck search for up to two cards with the same name as each of those units, call them to separate rearguard circles, and shuffle that deck. Returning five units ensures that even if the targeted rearguards have no copies remaining in the deck, they can be instead sent from the drop zone to the field with the deck as an intermediary. Functionally her skill allows for the rearguards to stand, and can combo with other cards from the set to allow for up to six attacks, although the "stood" units will not retain trigger effects. A basic example would be using Primavera with two columns of Wheel Wind Dragon. By attacking with both rearguard columns first and then with Primavera, her on-attack counterblast could target one of the Wheel Winds and his booster to call out the other two Wheel Wind Dragons and two of his boosting unit, making two additional 16000 power attacks. This gives additional chances for Wheel Wind to hit and unflip 2 damage, facilitating further use of Neo Nectar's counterblast-intensive support later on. Because of the nature of her skill, Primavera lacks innate synergy with stand triggers, as there is nothing remaining to stand after she has gone off. Furthermore, the job of card advantage support is handled by superior calls off of the generation break grade 3s Vegetable Avatar Dragon and Maiden of Ranunculus, the grade 1 and 2 Trifle Knights, and the early game stride unit Arborea. So draw triggers are likewise redundant for Primavera, making her one of the premiere twelve critical decks of the Soaring Ascent-on format. A more complex interaction would be to exploit the grade 2 Maiden of Gladiolus. Gladiolus' generation break 1 lets her counterblast 1 when she attacks and is boosted to search the deck for a copy of another rearguard and call it. So for example, you can attack with the grade 2 generation break attacker Grace Knight for 12000 power, then attack with a boosted Gladiolus for 16000 and use her counterblast 1 to superior call a copy of Grace Knight, then attack with the new Grace Knight boosted for 19000, followed by Primavera's 26000+ attack. Primavera's counterblast 3 would superior call two columns of Gladiolus and her booster to make the fifth and sixth attacks with. There would be no reason to try to use Gladiolus a second time in this situation since the new copy could only attack for 9000 power, and the deck would likely be exhausted of any remaining at that point. Primavera's skill caters to a different version of endgame compared to Jingle Flower's overwhelming field power bonus. She synergizes best with Wheel Wind Dragon for creating dual offensive and pressure attacks, and has the advantage of requiring more instances of defense over Jingle Flower forcing out more raw shield. Primavera is better suited to scenarios in which the opponent has a smaller hand size with larger shield distributions (i.e. many 10000 shield units) while Jingle Flower can overwhelm an opponent even when their hand is massive if their guard is distributed in denominations of 5000. An opponent with three perfect defense cards in a six-card hand is perfectly comfortable staring down Jingle Flower Dragon, but the same opponent trembles before Primavera.